Habit: Perennial herb from caudex, rhizome, or tuber. Leaf: basal, generally many, simple to compound, generally petioled; blade or leaflets lobed to dissected or not, margins entire or toothed; in flower or fruit withered or not. Inflorescence: terminal, flowers 1 or 2--7 in cymes; peduncle erect; pedicel elongated in fruit; involucre bracts sessile or stalked, generally in 1--2 whorls of 2--5, simple to compound, +- like leaves or leaflets in size, shape. Flower: receptacle elongated in fruit; sepals 5--10, petal-like; petals generally 0; stamens 10--200; pistils many, styles persistent as beaks. Fruit: achene. Species In Genus: +- 150 species: arctic, temperate worldwide; some cultivated for ornamental. Etymology: (Greek: flower shaken by wind) Note: Species with long, plumose styles sometimes placed in Pulsatilla. Habit: Plant 8--30(35) cm; rhizome spreading, thick. Leaf: 0--1, in flower persistent or not; petiole 4--20 cm; leaflets +- like involucre bracts in size, shape. Inflorescence: flower 1; peduncle glabrous; involucre bracts in 1 whorl of 3, stalked, generally 1-ternate; terminal leaflet-like unit 2--8 cm, 1--3(3.5) cm wide, +- diamond-shaped or ovate to oblanceolate, +- glabrous to strigose, margins crenate to sharply serrate on distal 1/2 (2/3). Flower: sepals 5--7(8), 10--20 mm, 5--8(10) mm wide, ovate to oblong, blue to purple, +- red, or pink (white), glabrous; stamens 30--60(75). Fruit: body 4--5 mm, oblong to elliptic, puberulent (glabrous); pedicel (1.5)2--5(7) cm; beak (0.5)1--1.5 mm, +- straight, glabrous; aggregate 8--15 mm, +- spheric. Chromosomes: 2n=16. Unabridged Note: Anemone oregana var. felix (M. Peck) C.L. Hitchc. a rare plant in marshes, bogs in Oregon, Washington. 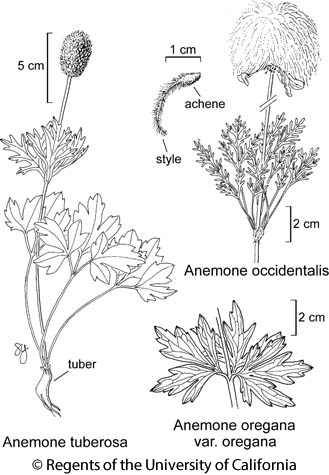 Citation for this treatment: Scott Simono 2012, Anemone oregana var. oregana, in Jepson Flora Project (eds.) Jepson eFlora, http://ucjeps.berkeley.edu/eflora/eflora_display.php?tid=54033, accessed on April 24, 2019. KR, CaRH; Markers link to CCH specimen records. Yellow markers indicate records that may provide evidence for eFlora range revision or may have georeferencing or identification issues. Purple markers indicate specimens collected from a garden, greenhouse, or other non-wild location.